An easy weeknight steelhead recipe with a quick lemon butter garlic sauce. Cut the lemon in half. Juice one half and reserve the juice for adding to your sauce. Cut the remaining half into 4-5 thin lemon slices and set aside. Melt butter in a small skillet over medium heat. Add garlic, red pepper flakes, salt, and pepper to melted butter and sauté, stirring frequently, for about one minute until garlic is fragrant and slightly soft. Remove skillet from heat. Stir in reserved lemon juice and set aside. Lightly oil a large sheet pan. Place steelhead fillet on pan. Pour butter mixture over steelhead fillet. Use a pastry brush, the back of a spoon, or your hands to lightly rub the butter mixture into the fish. Lay reserved lemon slices across the surface of the steelhead. You’re ready to bake! Bake steelhead at 375 degrees F for 20-25 minutes until cooked through. When it’s cooked, the steelhead will have slightly lightened in color and will be easily flaked with a fork. Top cooked steelhead with fresh chopped parsley. Serve immediately. Don’t worry too much about the weight of your steelhead fillet – if you’re in the ballpark of 1.5 or 2 pounds, you’ll be fine! If you’re using a much larger fillet, you may want to double the amount of sauce. What should I serve with this steelhead? 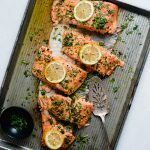 Serve this lemon garlic butter steelhead with your favorite roasted vegetables, pasta, mashed potatoes, or rice. If you don’t have a lemon, use 2 Tablespoons bottled lemon juice in the sauce (in place of the juice of 1/2 a lemon) and skip the lemon slices when baking. Change up the sauce by adding fresh herbs (I like rosemary, thyme, and cilantro), grated parmesan cheese, or a Tablespoon of honey. This sauce is very forgiving – don’t be afraid to make it your own! If you can’t find steelhead, use Wild Alaskan Salmon instead. If you have leftovers, let cooked steelhead cool completely, then transfer to an airtight container and store in the fridge for 2-3 days. Use cold steelhead in salads or sandwiches, or toss some flaked steelhead into your scrambled eggs or a hash the next morning.